Been There, Done That: Seriously?? You know you have one... a word that is your 'catch-all' word, the one that covers a range of emotions: happiness, unbelief, sarcasm, disappointment. Maybe it is 'Dude' or 'Wow". I have to say that I picked up, 'Seriously' from a fiery red-headed friend of mine that happens to be one of the owners of a truly cool toy store , which I will blogging about this week. I use this word a bunch. For example, I was at Wal-mart a few weeks ago with my two boys trying to do some grocery shopping for what we NEEDED, not what they WANTED. We headed to the check-out, minus white powdered donuts and Count Chocula, and I scanned the lines and chose one because it appeared this precious girl was almost finished. As it turns out, she was NOWHERE near finished. She proceeded to pull out 3 ads from competing grocery stores and haggled with the brand-new-wide-eyed cashier over the sale price of every item in her basket, because everyone knows Wal-mart has a low price guarantee, right? Oh, help me! So, of course, 'Seriously' covered quite a few emotions during that 30 minute ordeal. At one point, I wanted so badly to ask her, "Seriously, can you please just take his word that the baby carrots are the price they say they are?" I eventually got out of the line and made a bee-line to the express line. At this point, I had no concern that I had more than 20 items. For the love! But today, my darlin' 8 year-old son gave me a whole new reason to use my word. After church and lunch today, we took a long-awaited trip to Crave Cupcakes in Uptown Park with our good friends and fellow dessert-lovers, Mrs. Becky and Mr. Chappy. As you walk up, you can see the cupcakes being iced and the finishing touches being added. And it is obvious the word is out because the place was packed! Lucky for us, they still had a great selection to choose from. We came home with Vanilla, Red Velvet, Key Lime, Candy Bar and Chocolate Peanut Butter. So far, the ones we have tasted make you want to slap your granny... All of us except for John Tyler. He took one bite... then another... and then told me he just didn't really like it. Now, I KNOW he is my son because I endured 6 hours of back-labor to bring him into the world AND he might be a tad high-strung, just like me (no comments, please!). But it was the next sentence that left my mouth open-wide. "Mom, can I please have some apples and carrots instead of my cupcake?" Seriously? I just paid $3.25 for a little piece of heaven with buttercream icing and the dude wants apples and carrots. Hmph. Well, I guess his title of being a 'Weddding Buffet Eater" because of his standard diet of apples, carrots, cheese and crackers was not too far away from the truth. 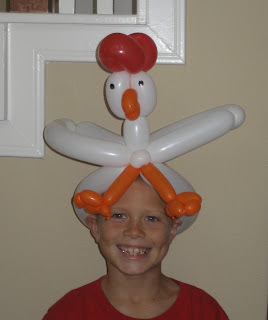 And anyway, who can trust a kids who wears a chicken balloon-animal on his head. 'Nuff said.